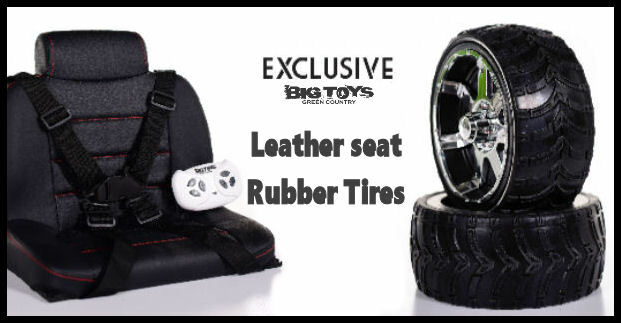 Get your child in their very own crawler truck with rubber tires. There are no limits when your child has over 9" of ground clearance working suspension & optional 4 wheel drive.The Crawler Ride On truck also has a plush leather seat for your little adventurer. This kids size battery powered truck also has an AUX/MP3 input so your toddler can listen to music. So let them kick back in this high rolling lifted truck, turn on all the cool lights, and enjoy the open trail. While you have the peace of mind that you hold the remote control in your hands to stop or divert your little ones from potential danger. Some other notable features include the super bright Halo style LED Headlights & working taillights will be sure to light the way after the sun sets. This Rugged Ride On Truck has factory upgraded premium 10K drive motors and has plenty of power in both the 4WD or 2WD Version. Upgraded HD Receiver Control unit. Approx Run time 35-70 Mins depending on surface. Includes drive motors on ALL 4 Wheels. Wider turning radius due to front drive motors. Approx Run time 45-95 Mins depending on surface. Includes (2) rear drive motors for power to rear wheels. Tighter more nimble turning radius to get around tight spaces. I got this jeep for my daughter to drive in our yard and in our field behind our home. Big rubber tires allow her to grip on most surfaces and she's able to go over logs and rocks with ease. When the jeep was delivered, the bumper was broken by the shipper, but Big Toys got me a new bumper sent out immediately. Great service, these guys stand behind their product. We got our daughter this pink truck and she's in love with it! She drives all through the yard and has such a fun time jamming music and having a ball! If you have a little girl this pink truck is a MUST HAVE! 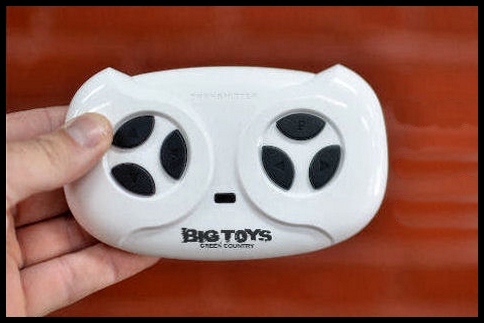 Click the button below to add the 4x4 Ride on Crawler Truck Rubbers Tires + Parental RC Remote - Pink to your wish list.